Introducing the Factory Cat Pilot. Yet again Factory Cat brings a solid yet sleek machine to their lineup. The Pilot fits in the category of Micro Rider Scrubbers. Don't let the word micro fool you, this machine offers huge productivity of 23,034 sqft per hour with a capable run time of 6 hours. 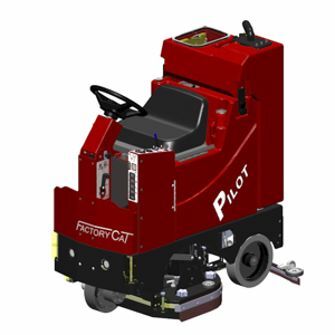 The Factory Cat Pilot is equipped with a powerful drive motor that has the capability of climbing steep inclines. Weight w/ battery: 850 lbs. Scrub Path: 20" - 28"
Down Pressure: 0 - 150 lbs.